Smart thermostats - Are they right for your home? Heating and cooling takes a lot of energy, and can become very costly in the summer and winter. How would you like to have lower energy bills, more control, and a more comfortable home? It’s a lot easier than you think. All you must do is purchase a smart thermostat. BCS Heating and Cooling, Prescott’s premier HVAC experts, is here to tell you how you and your home can benefit from a smart thermostat. Remove human error - Smart thermostats are just that: smart. They can learn when you are home, when you go to bed, and what temperature you like. This allows the thermostat to adjust the temperature based on all those variables, which can significantly reduce your bills, especially if you tend to forget to turn off your heater or cooler. “Pre-wake” - No one likes to come home to a cold home. Smart thermostats can preheat your home, giving you all of the comfort of a home where the heater never turns off, without all of the bills. Pets? No problem - The previous two examples of who a smart thermostat can help your home might make you think “why would I want my pets in the cold all day?” Smart thermostats can be programmed to have a minimum and maximum temperature to make sure that your animals will never get too hot or cold. And, with smart room sensors, you can tell if a specific room is too hot or cold rather than just the area around the thermostat. Remote Control - Another great benefit of a smart thermostat is that you can adjust the temperature anywhere. So, if you happen to come home early from work one day you can still preheat your house. Or perhaps you’d like to disable all smart features while you’re on a vacation? Well, you can do that too. Any internet connected device can view and adjust the temperature of your house. Smart Logging - Your thermostat will track various data like how much your heater and cooler ran last month, how efficient your heater is, and even how well your house holds heat. And, you can compare it to previous months and even previous years. 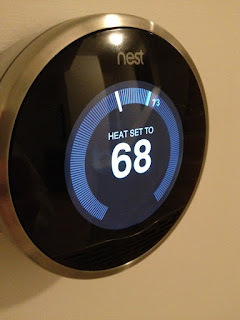 Ease of Use - The great thing about smart thermostats is that they require little to no setup. Just plug it in and set the temperature, and it will begin to learn. If you aren’t tech savvy, or don’t own a smartphone, no problem! It’s almost easier than a traditional thermostat. Money Saving - The whole point of a smart thermostat is to make your house more comfortable, while still saving you money. Depending on your current heating and cooling habits, letting a smart thermostat control your home’s climate could be a significant bill reducer. As you can see, smart thermostats can be a wonderful, cost saving addition to any home. We’re sure that you’ll see the difference in your comfort levels, and in your energy bills. If you need help installing or learning how to use a smart thermostat, or to schedule an HVAC maintenance or repair in Prescott, give BCS Heating and Cooling a call. You can reach us at 928-445-9700 for more information.